Strategic or not, nine out of ten companies have some kind of content marketing in place these days – even if they don’t realise. The reason is simple, your customers trust content more than traditional advertising, with 70% of them saying they’d rather learn about a company through an article than an ad. However, very few companies are using content marketing to lead and supercharge long-term business growth. Most small businesses start publishing content without having proper strategy and documentation in place beforehand. Such content marketing efforts soon fizzle out when people see that their content is not generating the kind of engagement they would like to see. The concurrent content marketing revolution stems from our insatiable hunger for more and more fresh content. How many times in a day do you check your Facebook or Twitter feed, or see if there’s anything interesting on Instagram? Suddenly, we need more videos, articles, photos, and other forms of content than we ever did before. Having a strategy for your digital marketing has never been more important. In order to create and share your content, you need to have a solid content marketing business model that covers how and what types of content you will create and share, the channels you will use, the industry experts you can lean on and the results you’ll achieve. Content marketing may not be as expensive as native advertising, but it can still cost you a considerable amount of money. A recent study reveals that companies running the most effective content marketing campaigns are paying their agencies between $5,000 to $50,000 per month for their services. Even if you are planning to spend much less than this range, you’ll still be making an investment in your business, for which you’d like to receive a return sooner rather than later. Like all other marketing activities, content marketing will only make sense if it delivers a positive ROI and long-term growth. To start with, you’ll need to get your boss, partners, and staff in your organization on-board and gain their support for your strategy. The more people you involve, the more ideas you’re likely to get. Ideas are imperative for good content marketing. The people you involve will ‘own’ the model you build and should be willing to contribute and share the responsibility for making the plan a success. For that, you need to communicate your reasons for creating content, your vision of a successful content marketing campaign, and the obstacles or problems that you foresee. Why does your business needs content marketing? 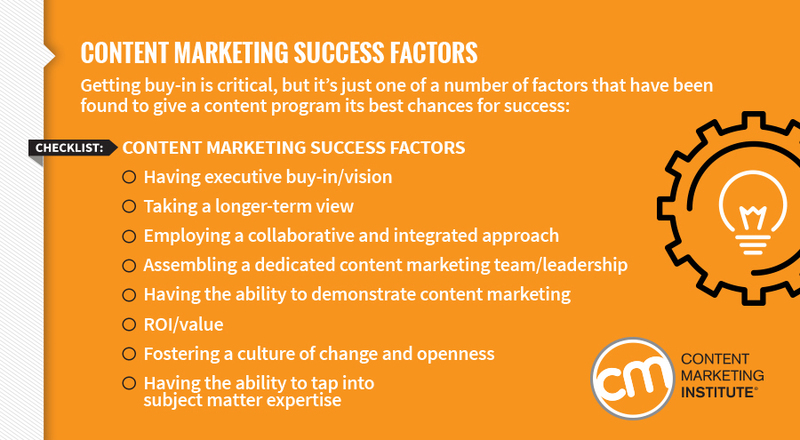 How will your content marketing help achieve consumer and organizational goals? Tip: Top content marketing agencies and clients consider the number of back-links that a particular piece of content generates to be a good measure of the content’s effectiveness. Many businesses make the mistake of creating content for their brands or products, and not for their customers. You should remember that your buyers don’t go online to read advertisements about your business or product. They will engage with your content only if they find it interesting. And they will find it interesting as long as it offers value by solving their problems, answering their questions, or simply by entertaining them. That’s why you need to know your customers and understand their needs – you have to offer a reason to read your content. Are there different groups of audiences you’ll be creating content for? For instance, you may need different content for males and females, young and elderly, startups and established businesses, or people living in specific geo-locations. What are their content needs? What are the topics that most concern them, with regards to your business or products? For example, Home Depot knows its customers want to DIY as much of their own home-improvement work as possible. So, they’ve been offering how-to DIY guides for many years, and have hosted tons of helpful videos on their website. What are their media habits? Do most of them use Facebook, YouTube, or any other channels? Do they like to watch video more than they like to read text? Do they use mobile or desktop for locating and engaging with the content they like? Decide the channels and content-mix based on the media habits of your target audiences. Essentially, a content map is a variation of a mind map. There are no fixed formats to be followed. You can draw a tree, with various branches depicting different types of content going to different channels, and the stem being the main theme of the content. You may need several content maps depending upon how many bigger content themes you’ve identified. Here’s a quick sequence to get you started. Specify the channels and type of content—Will you publish a particular blog post on your own blog or another website? Will you rather produce a video and publish it to YouTube? Tip: Your choice of topics and channels must correspond to your audience’s needs and media behavior. Most importantly, the topics must be relevant to your business. Ultimately, the whole content marketing business model is there so that your business and brand can grow. Now is the time to finalize the key messages that you want to communicate through content marketing. When people like your content and visit your website to see who you are, you’ll need a compelling brand story to hold them captive. Think of your brand story as a breathtaking account of your mission, inspiration, values, and goals—the reason your business exists. Before you can come up with your story, you’ll need to do a bit of research on your competitors to differentiate your messages and value propositions from them. Your story must resonate with your customers and connect with them at a deeper level than buying and selling. There can be so many ways of telling your story. Some companies dedicate whole sections of their websites to brand storytelling, using text, video, and pictures to convey their key messages. Others may just use an About Us page for this purpose. Whatever the method that you decide for telling your brand story, keep in mind that the message in your content will be an explanation of your mission and values as stated by your brand story. Therefore, it’s important to write a story that is free of loopholes and has the right strategic depth to drive the whole content marketing strategy. Why does your business exist—your vision? What is your history and background? Who were your founders and how they were inspired into founding the business? What was your major failure and how it turned into success? Relatively fewer articles talk about a content creation plan, but great content marketing is impossible unless you’re creating awesome content. Your content map will provide the guidelines for your content mix, including the posts you need written, the photos and videos you need produced, the updates you need posted, and so on. In all probability, you’re going to need a professional writer, a graphic designer, a photographer/video-maker, a social media manager, and of course, the necessary gadgets, props or locations for creating what you need. Entrepreneurs, and micro-business managers can always play some of these roles themselves and still manage to drive impressive results. I recently wrote an article about visual content, you might find this handy to help with the imagery of this step. While you’re at it, you should also prepare a forecast the amount investment that you’d be putting into content marketing. Estimate the cost of different activities, such as copy writing, photography, video production, salary of the talent you employ, media buying, etc. Your budget will tell you how much and what types of content you can afford to create, and what kind of returns you should expect from your content marketing campaign. There’s no hard and fast rule for how much you should allocate to content marketing, but two different studies indicate majority of the surveyed companies are spending an average of about 25% of their total marketing budget (excluding staff salaries) on content marketing. It will be unwise and expensive to try and create all of the content yourself. Research has shown that the companies that generate the most number of clicks from their content only create 25% to 50% of their own content, while curating third-party content for the remaining part. The sweet spot is around 40% created and 60% curated content. Your content curation plan will spell out the topics and sources of the content that you are going to curate. Apps such as Pocket and others can make your job easier, as you can earmark content that you see anywhere on the web and schedule it to be published to your channels later on. You’ve already outlined the content distribution platforms during the content mapping stage. In this step, you should focus on those channels in more depth. Decide the objectives for each channel in terms of reach, engagement (shares, likes, clicks, etc), leads, and conversions. How will you modify your messages for different channels? What will be the frequency of posting? All these things will go into your channel plan. Corporate blogs add real weight to your content marketing. The main content marketing platforms include your website, blogs, social media (including Facebook, Twitter, Instagram, YouTube, and other networks), and email. The channel plan will make it easier for you to track the results obtained from each channel, so that you may focus more on the more profitable ones. If you remember, you decided to track some KPIs during the goal setting stage. Your content marketing evaluation plan will describe how you are going to measure the KPIs and how often. Google Analytics is your most basic and important tool for the purpose. Using Google Analytics, you can view the referral traffic sources and determine which channels are performing better than others in terms of sending you traffic. You can further track the conversions and see which particular channels are sending you better quality traffic. Similarly, you can track the number of times that your content is viewed, linked to, or shared by users. Also decide who is going to be responsible for collecting and reporting data. Here’s a simple template that you can use for evaluating different KPIs. Learn from your mistakes, see how different types of content are performing, build on your strengths, strengthen your weak areas, and continue improving the output of your content marketing effort. Remember the basic rule—it’s the quality that matters more than the quantity. A high-quality, evergreen piece of content that you publish today will remain their forever. And forever being a long time, the leads and growth it will bring will far exceed the cost of its creation.